I am the Arcane is a gothic metal/occult band from Spain. For the album “Societas Arcana” we searched for an obscure ambiance related to secret societies and dark imagery. For that we tried to build a “bridge” between Rosicrucians/ Freemasons and World War I, sacred and profane, creation and destruction. The browns and greys from the artwork match their dark occult music as the sounds turn into a solid matter. The metal band MorphiuM is inspired by a wide variety of musical influences which go from the most extreme metal to the more melodious and melancholic metal. For them we imagined a geometrical scenario, the mind of the great Architect marked with his own seal. The design itself resembles a construction upside-down, growing its foundations from the skies, from light to darkness. The skulls at the center are duplicated and represent the creation of Eve from the body of Adam as the major work of this Architect. WARG is an epic thrash metal band from Zaragoza, Spain. For this new album “Dark Tails” we created two lovecraftian designs. We decided not to get attached to any Lovecraft’s creature in particular but to blend some tentacular gods. We wanted to make them kind of disgusting fish-like monsters with esoteric and occult details. Having human skulls as heads make them a little more bizarre and that was the keyword we were looking for. For this session with Astrodome and Iguana with revived Lamassu, an Assyrian protective deity, often depicted as having a human head, the body of a bull or a lion, and bird wings. The waves around the creature represent the mythical-esoteric-psychadelic style of these bands. This poster is another shot we tried in the psychedelic style. God has plan for us all, we are searching for this plan and for the meaning of our life on Earth. We were so excited for this concert, two bands we love, an amazing place and nice people. We get some inspiration on Gustav Klimt works, specially the one called Hygea, which is the goddess represent in this poster and also the goddess of Health. We transformed this deity into a evil looking woman with a burning skull and a long snake. Her dress was inspired in Klimt works and also in some islamic art and stories like Sherazade from the 1001 nights. On the background there is an obscure place like a swamp or other gloomy landscape. 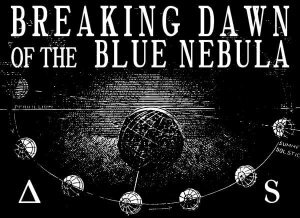 Breaking Dawn of The Blue Nebula is an Asturian band of progressive rock with psychedelic overtones close to post-rock and stoner. It stands out for its instrumental themes of long developments. A characteristic feature is the use of mandolin and violin within the usual formation of two guitars, bass and drums. For these guys we wanted to travel across the universe searching for the true essence of human soul. Due some physical limitations, we found ourselves stuck in this earth. However, our will was stronger than our bodies and we felt our spirits go away, stargazing. They returned with no explanations but they took with them the most exquisite images. Shapes, colours, dots, lines, chaos, cosmos. Everything so absurd yet so beautiful. We stopped asking questions and the answers came to us. ASTRODOME are a 4 piece instrumental Heavy Psych band from Porto, Portugal. Epic tales, long musical journeys into fuzzy riffs, groovy beats and echoing chords, a trip to whom wants to lose in outer space. For them we developed two designs associated to the Ancient Mesopotamian Mythology with elements of middle East aesthetics especially Persia or Babylon. We can see some psychedelic references from the 60’s and 70’s music/movies such as Alejandro Jodorowsky’s the Holy Mountain. Noctem is a Blackened Death Metal band with a long trajectory of more than 15 years. With 2 demos, 1 live LP and 4 albums, released with Prosthetic Records, Art Gates Records, NHR and Metal Blade Records. After 15 years career, Noctem is one of the most active bands from Spain. Extreme music, aggressive shows, blood and fire is the mark of this band. For them we elaborated two Flags/ T-shirts strongly influenced by the atrocities of spanish inquisition and also different allegories of blasphemy or capital sins and moral vices (see Cesare Ripa’s “Iconologia”). The references of books such as Goetia, Chants of Maldoror or Divine Comedy can be seen as well. Do you hear the darkness calling? Forum Fantástico is a Portuguese Annual Convention dedicated to the Fantastic, on all its forms of expression, ramifications… and connections! We were very excited to work with Forum Fantástico, it is a small convention of Sci-Fi, Horror of Fantasy, full of nice people. For them we wanted to work again with Lovecraftian subjects and horror stories related to the sea because Lisbon has lots of stories related to fish-creatures. You can actually feel that dark atmosphere if you walk by the sea at night. Seeking perfection through the search for self identity we find a “Cosmos Consciousness” and from the roads of our personal journey we watch two worlds colliding, like a car crash, but somehow the Chaos is turning Cosmos. This process is a symbiotic endeavour between Credo Quia Absurdum and Sci-Fi Lx. And every twist and turn comes together in a beautiful waltz where reality and illusion dance together to the symphony of time and the choreography is set by space itself. Alongside the characteristic traits of our universes added another layer of dimension to this provocative portrait of self awareness. The two heads symbolises the union and expansion. The vital bridge is set by the influence of a circle which contains a voyager in time and space, his body, still, separated, found the new purified mind and together as one they could bloom once more.